Rainey Day Studios began as a wildlife art gallery in Cambria, California in 1982. 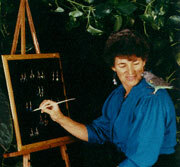 Drawing on a formal education of zoology and art at Mills College, biological illustration at Cal Poly in San Luis Obispo, and ten years of wildlife painting experience, studio owner Joan Rainey Day began painting on silver and handcrafting wildlife earrings during the slower winter days in the gallery. Seven years of cross-country travel then followed, making earrings and setting up accounts across the United States, in partnership with Cambrian Goldsmith. In 1990, Joan began wholesaling her wildlife designs in order to remind us of the beauty, dignity, and inspiration found in our natural world. Today the business is expanding from just jewelry to include wall hangings, nature signs, murals, and original and custom art. Exploring the wonderous beauty and interrelationships of life on our planet has, since childhood, been Joan's primary focus. Believing that we are intimately related to and involved with every life form on the planet and that the whole of nature is a symbiotic relationship drives her to continually learn about and appreciate our interconnectedness. Joan's desire when designing is to portray the inherent beauty, dignity, and spirit of each species so that we may relate to and connect to the essence of its being. She finds joy and guidance in nature and receives great pleasure in creating small rememberances of this beauty to share with others. We are experiencing temporary web problems. Contact Joan for any information not available. Thanks for your patience.